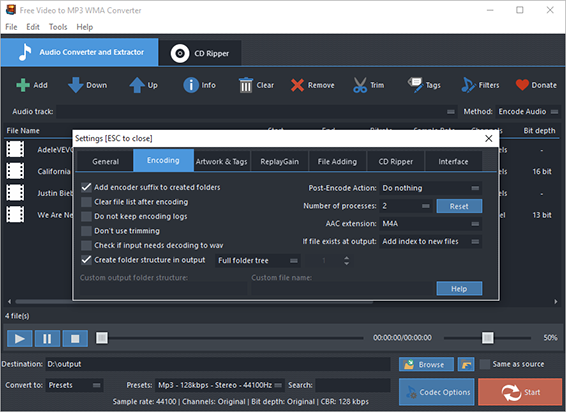 With Free Video to MP3 WMA Converter, you can extract audio from all types of video files to output as MP3/WMA/WAV/FLAC format in batch mode. 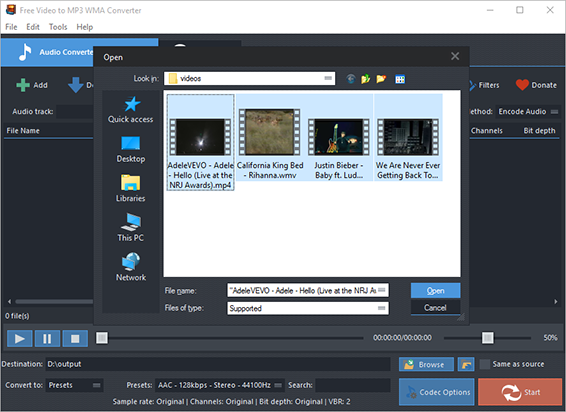 Please download and install Free Video to MP3 WMA Converter at first. Click “Add” to import video files: “Add Files” is for one or more files; “Add Folder” is for a folder containing video files; “Add Folder Tree” is to import a folder with subfolder(s). To change the conversion order, use “Up” & “Down”. Select one conversion type (Presets or Codec) from “Convert to” menu. If you choose “Presets”, then choose the presets you prefer from a whole list of quality presets in the menu of “Presets”. “Codec Options” can be used to adjust codec settings. After that, click “Browse” to choose an output folder for the converted audio files and the “Same as source” is to save them in the source folder if needed. If all settings are ready, click “Start” to start audio conversion. When the conversion is complete, click “Open” to find the converted files in the output folder.